My preschoolers are obsessed with all of my trinkets. I can’t actually call them manipulatives because of all the different random items we use in my classroom as learning materials. I’m not sure if it’s the small size of these items that we use to count, build letters, pick up with squeezers, fill a sensory bin with, just play with, or if it’s the amount of different activities we can use one kind of item for but they are always a hit! Whatever the reason, I could not be happier that they are so willing to jump into any learning activity I have set up with our latest favorite mini erasers, counters, jingle bells, coins, paper clips, beads, or jewels, because they are all in when they play. 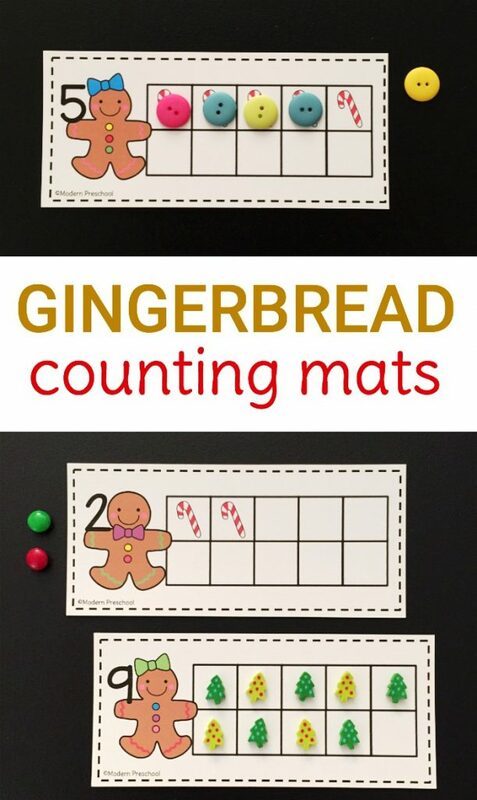 Our gingerbread 10 frame counting mats (2 leveled versions!) are the perfect addition to our math activities this December! This counting activity can be printed from the file below. 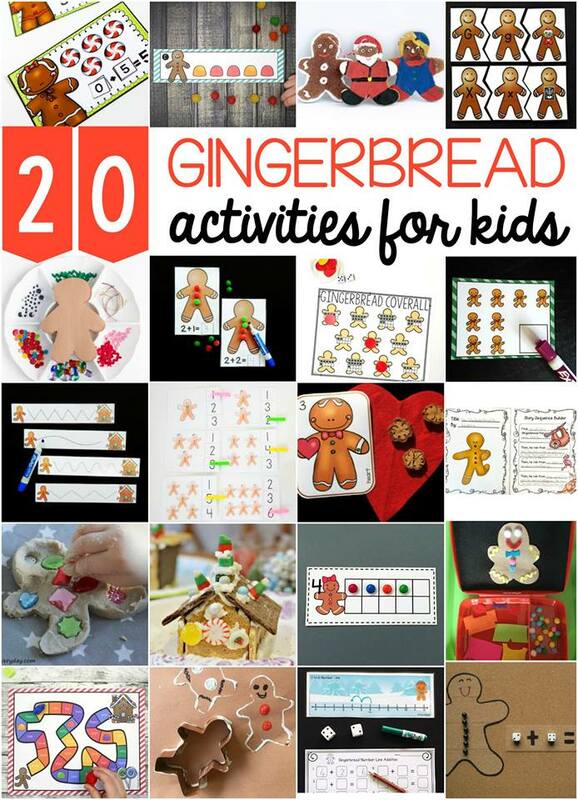 It includes 10 gingerbread counting mats with blank 10 frames. It also includes 10 gingerbread counting mats with the 10 frames correctly filled in. 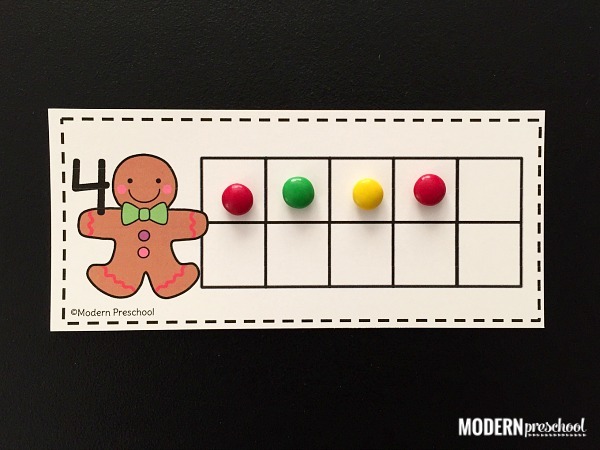 This makes our gingerbread 10 frames perfect for different leveled learners! Print the pages from file that you will use. Laminate the counting mats for added durability. Cut them apart. Now it’s time to play! The great thing about these gingerbread 10 frame counting mats is that you can use anything you have on hand as counters. My preschoolers love the holiday themed mini erasers. I’m also a fan of using candies because they are so inviting and engaging when it comes to little kids. And other items like buttons, magnetic coins, and game pieces work well too! The goal with the counting cards is to add the correct amount of counters to the gingerbread 10 frames. 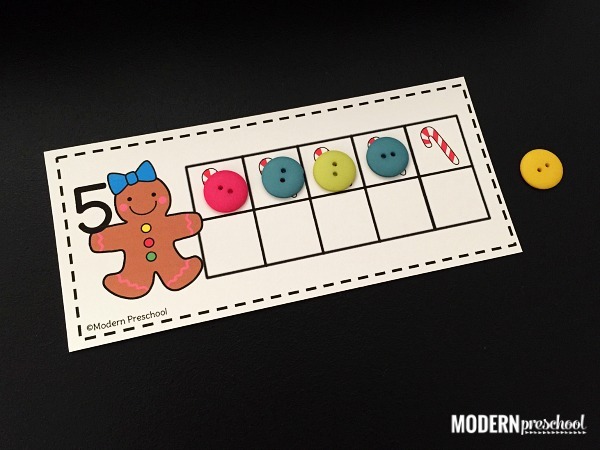 Match the number of counters to the number printed next to the cute gingerbread cookie. Offer the 10 frame counting mats that have the candy cane counters printed on them already for kids who are still working on number recognition and 1:1 correspondence. Use the blank 10 frames for more of a challenge! Grab your set from the pink box below! Don’t stop the gingerbread fun here though. I am the hugest fan of fine motor activities. Building those fine motor muscles is so important in the early years, so that there is success with writing, tying shoes, zipping jackets, squeezing toothpaste, and more. 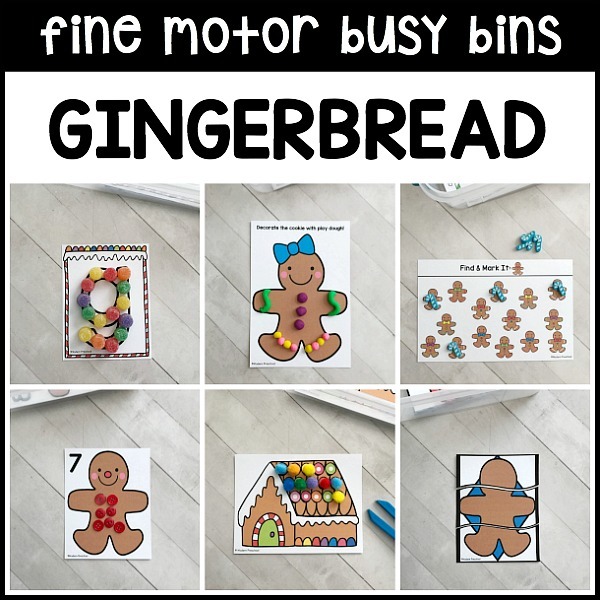 Intentionally add themed fine motor work into your schedule with our fine motor busy bins!